The standard of entries was so incredibly high,” says Sophie Robinson, interior design expert and guest judge on BBC2’s The Great Interior Design Challenge, as she emerges from a day of judging finalists in TTG and Royal Caribbean’s Royal Makeover competition. 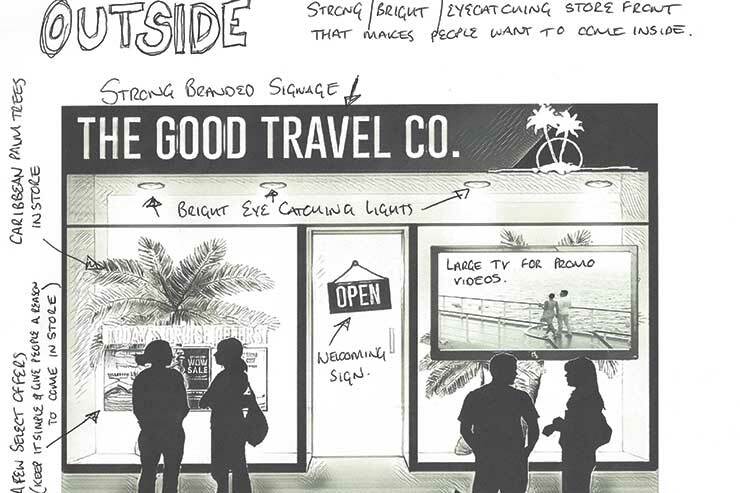 Five finalists presented to a panel of judges from TTG, Royal Caribbean, Balance – a shopfitting company, and Robinson herself, with an aim to win the chance to transform their store with £20,000 from Royal Caribbean. “The finalists are experts in selling holidays, not at interior design, so they did incredibly well. It was clear that they really know their customers and their business and that came through in their designs. They know that a holiday starts as soon as a customer walks through the door rather than when they arrive at the airport,” she comments. Robinson says she noticed all the finalists’ current stores looked more like offices than attractive stores where customers were enticed to buy, which she notes is clearly due to financial constraints. “What is nice about this competition is that it is about being able to unlock that potential,” she says. Vanessa Good from The Good Travel Company impressed Robinson with her “innovative and intelligent ideas”. “I said to her when she left: ‘If you ever decide you don’t want to be a travel agent, you should think about becoming an interior designer.’ It’s hard to avoid being a cliche when designing a space to sell holidays, so I liked the fact her ideas were new and interesting. For agents keen to inject some fresh touches into their own agency but restricted by limited funds, Robinson has some practical advice. “My mantra is when money is tight, go big on colour. In terms of painting walls, changing carpet or even furniture, big blocks of colour can really uplift a space and transform it without having to cost too much money. She highlights the importance of first impressions too. “It starts before they’ve even walked into the shop. The store front is really important, so think about your signage and branding and try to do something different with your window display – make sure you are not ordinary. With store frontage such a priority, Robinson was particularly impressed by winning agency Atlantic Travel Worldchoice’s idea for an elaborate, stepped entrance styled on the Ultimate Abyss slide found onboard Royal Caribbean’s Oasis-class ships – which would stop passers-by in their tracks. Robinson adds that agencies should also try to draw people towards the back of their premises. “Put the desks at the back of the store and the fun things at the front so you can see them through the window and so you are using all the space,” she says. In the winning design, for example, the window space is occupied by a seating area inspired by the Central Park area onboard Royal Caribbean, with a curved wooden bench and impactful trees in pots, while the consultation desks are further back in the store. Robinson also noticed a number of the finalists mentioning that brochures were becoming less prominent. “It’s a good idea to have a store room where you can keep the clutter tucked away and make sure your customer space is really clean, open and well organised,” she says. Having spent a day in the company of five independent agents, Robinson says one of the key things she realised was how important it is for their personality to shine through in the store.